How do I collect addresses and phone numbers for donors on my campaign? While donor email addresses are automatically collected, you can opt to collect addresses and phone numbers in your report, as well! 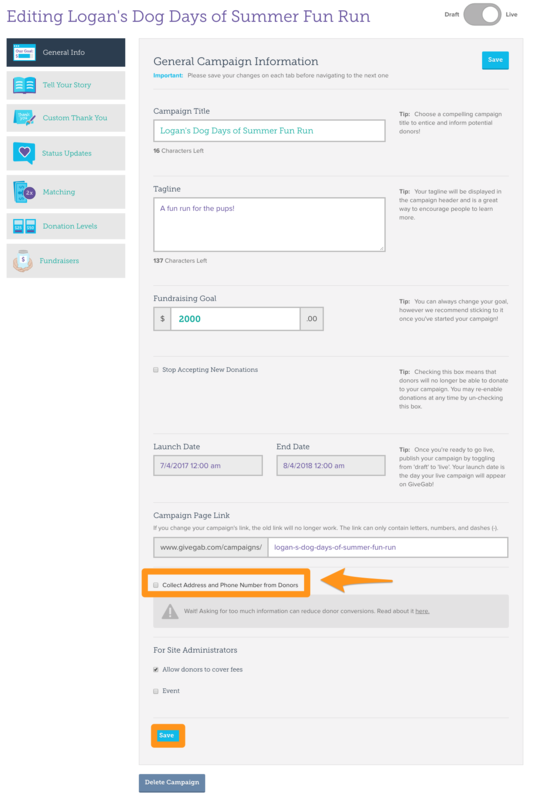 Select the "Fundraising" tab in the left navigator of your Admin Dashboard, then click the "Campaigns" section. Once in the Campaign section of your Admin Dashboard, select the "Edit" button beneath the campaign you'd like to edit, and you'll be directed to the Campaign Editor. You will land immediately on the "General Info" tab within the Campaign Editor, which is where you can choose to collect this information. Scroll down to the very bottom, and check the box that says "Collect Addresses and Phone Numbers from Donors". You will see "Saved" appear next to this option when your choice has been recorded.